John McCaffery kneels at Padre Pio’s side. John McCaffery was a man of many talents and accomplishments. In different periods of his life he had worked as a writer, a university professor, a journalist, and a business man. In Donegal, Ireland, he tried his hand at farming, which he enjoyed very much. During World War II, John lived in Switzerland where he was the head of an underground resistance operation against the Nazis. It was in Switzerland that he first heard about Padre Pio. One day John’s confessor, Father Rizzi, gave him a book about Padre Pio. He told John that Padre Pio had the stigmata as well as many other extraordinary spiritual gifts. John accepted the book but knew that he would not read it. For one thing, John had always been skeptical about so called mystics and from what Father Rizzi told him, Padre Pio definitely seemed to be in that category. John’s intellectual mind set made him suspicious of any kind of supernatural phenomenon. As far as he was concerned, mysticism was something to be avoided. The book on Padre Pio would remain on his shelf, but he knew he would not open it. The next conversation that John had regarding Padre Pio happened when World War II was coming to a close. John’s confessor at that time was a Capuchin priest in Milan, Italy named Father Gian Antonio. Father Gian Antonio told John that he had visited Padre Pio in San Giovanni Rotondo on one occasion. During his visit, Father Gian Antonio noticed the great respect which every one of the Capuchins demonstrated toward Padre Pio. He told John that it was very impressive. He reasoned that the Capuchins who lived with Padre Pio on a daily basis knew him like no one else. Since their esteem for him was so obvious and so sincere, it was a good indication that Padre Pio was a holy priest. When Father Gian Antonio made his confession to Padre Pio, he experienced a deep and profound sense of peace. After sharing his story, Father Gian Antonio gave John two photographs of Padre Pio. Still, John’s heart was unmoved. As time passed, other people spoke to John about Padre Pio. A friend invited him to go to San Giovanni Rotondo to attend Padre Pio’s Mass. John was not enthusiastic about the idea. Why should he travel such a long distance to attend Padre Pio’s Mass? There were many Catholic churches where John lived in Milan and Mass was said every day. Although he was reluctant to accept the invitation, John finally agreed to accompany his friend to San Giovanni Rotondo. He had been hearing about Padre Pio from various friends and associates for at least ten years. All of John’s doubts about Padre Pio disappeared when he attended his Mass. Padre Pio radiated an aura of sanctity. The way in which he pronounced the sacred invocations had a powerful effect on John. Every word was spoken slowly and solemnly. The majority of those in attendance were poor people – farmers, laborers, and people of the working-class. John observed that all who were present seemed to be aware of the sacredness of the Mass. On his first visit to San Giovanni Rotondo, John and several others were invited to visit Padre Pio in his cell. They were able to converse with him for over an hour. When it was time to say goodbye, John was reluctant to leave. Meeting Padre Pio and attending his Mass had been a far greater experience than he had ever imagined. Three times a year, John traveled from Ireland to Milan, Italy where he had business interests. He would stay in Milan for six weeks at a time before returning to his family in Ireland. After his first visit to Padre Pio, whenever he could break free from his work, he would travel by train from Milan to San Giovanni Rotondo. John soon became a familiar face at the monastery. Through his visits, he became acquainted with many of the Capuchins who lived with Padre Pio. Giovanni Vignolini, Padre Pio’s infirmarian, was one of them. Giovanni had access to Padre Pio’s cell at all times. He cared for Padre Pio whenever he was ill, which was often. He also assisted Padre Pio in taking care of the wounds of his stigmata. Giovanni frequently allowed John to accompany him to Padre Pio’s cell. Whenever John was with Giovanni, he was able to walk right past the monastery porter without being stopped and turned around. John soon learned that nothing could be hidden from Padre Pio. He frequently read John’s mind by telling him exactly what he had been thinking. From time to time, Padre Pio would relate to John what John had been discussing with the other Capuchins. Even though Padre Pio had not been present during the discussions, he somehow knew all the details and could repeat the conversations almost verbatim. Without ever seeing John’s business calendar, Padre Pio at times, would remind him of the appointments he had scheduled for the upcoming week. In addition, when John was struggling with a difficult personal problem, Padre Pio always seemed to be aware of it. John never had to explain anything to him. Sometimes Padre Pio gave John advice that did not seem quite up to the mark. But John soon learned that if he followed the advice, things would always work out to his best advantage. On one occasion, Padre Pio said to John, “You have spent your life traveling from one country to another. Since the time of your childhood, I bet that you have never spent more than seven years in any one given place.” Later, John thought about what Padre Pio had said. When he did some calculations, he realized that Padre Pio had been right. Throughout his life, John had spent almost seven years exactly, living in one particular area before relocating to the next. Those who were close to Padre Pio were well aware of his remarkable intuitive knowledge. Even though Padre Pio did not listen to the radio, read the newspaper, or watch television, he always seemed to have a complete grasp on world affairs. He could discuss international politics with remarkable insight. At times, he knew the contents of letters he had received, that is, before opening them. On one occasion, when Padre Pio was sick in bed, one of the Capuchins brought a number of letters and packages to him to be blessed. He blessed all but one item, which was an envelope. “I am not going to be able to bless that,” Padre Pio said as he pointed to the envelope. It aroused the curiosity of the Capuchins who were present in his cell. They later discovered that the envelope in question contained a betting ticket for the football game. Whoever had slipped it in with the other letters, obviously did not realize that Padre Pio refused to bless gambling ventures. When John was a professor at the Genoa University in Italy, one of his students had a brother who decided to test Padre Pio’s powers of discernment. In the confessional, he told Padre Pio that he was there, not to confess his sins, but to ask for prayers for one of his sick relatives. It was not true. The young man did not have any sick relatives. The moment the words escaped his lips, Padre Pio became angry and ordered him out of the confessional. The young man soon realized the error of his ways. Not long after, he returned to Padre Pio’s confessional and apologized. He then made a sincere confession. At the time of John’s visits, Mass was still said in the small church of Our Lady of Grace. On seven occasions, John had the blessing to be the altar server at Padre Pio’s Mass. One time, one of John’s friends hired a professional photographer to take pictures, not only of the Mass, but also of John assisting Padre Pio as altar server. He knew that John would treasure the photos. Padre Pio noticed the photographer in the church before the Mass started and spoke to him. He gave him permission to take no more than two photos. The photographer happily agreed. But the temptation to take more than two photographs evidently won out. During the Mass, he used two rolls of film. When he went to develop them, every picture came out blank. Even though John would have loved to have had a photograph taken while he was serving Padre Pio’s Mass, he possessed something which he cherished even more – a precious relic of Padre Pio. It was a piece of bloodstained bandage that had covered his stigmata. It had originally belonged to one of the Capuchins in San Giovanni Rotondo. How the Capuchin came to possess the relic is a story in itself. On one occasion, when John was conversing with one of his business associates, he experienced the charismatic perfume of Padre Pio. At the time, his business associate was having more than his share of personal problems. While they were talking, John was wondering to himself whether he should say something about Padre Pio. The man was not a Catholic and John was certain that he knew nothing about Padre Pio. While John was turning the idea over in his mind, he suddenly perceived a beautiful fragrance of perfume. He believed that the fragrance was Padre Pio’s way of saying, “Yes, you should say something.” The man was very receptive and seemed genuinely interested in what John shared with him about Padre Pio. Shortly after that, John and his friend Piero Pellizzari were visiting Padre Pio one day at the monastery. Piero said to Padre Pio, “John’s wife had a wonderful experience. She became aware of your presence by the sign of perfume. It happened at her home in Ireland.” Padre Pio then looked at John and said to him very gently, “John, even beyond the sea.” He was referring to the fact that there were no barriers that prevented him from being with his spiritual children, wherever they might be. Once, John met an American priest at the monastery. He told John that his short encounter with Padre Pio had been very disappointing. He had been offended by Padre Pio’s brusque manner. He told John that he would never again return to the monastery of Our Lady of Grace. Padre Pio had been rude to him in front of a number of people and what was worse, had declined to hear his confession. The priest was angry as well as hurt. The priest listened with attention to what John told him and seemed very satisfied with the explanation. The next day, he was able to visit Padre Pio in his cell and make his confession. It turned out to be a grace-filled experience. Padre Pio accepted the priest as his spiritual son and a strong and lasting bond of friendship developed between the two. John met another man in San Giovanni Rotondo who, like the American priest, found his first meeting with Padre Pio to be more than a little upsetting. The man was an industrialist from northern Italy. Thirty years before, he had come across a book on Padre Pio almost by accident. He found the book in a hotel where he was staying, and having nothing better to do, he read it. After he finished the book, he never gave it a second thought. Later, the man became involved in spiritualism and took it upon himself to share his knowledge about the subject with his family. One of his sons took great interest in spiritualism and eventually became a proficient and successful spiritual medium. But tragedy struck the family when his son had a nervous breakdown. He finally had to be committed to a mental institution. His father was distraught, and while trying to think of a way to help his son, he remembered the book on Padre Pio that he had read some thirty years before. He decided to travel to San Giovanni Rotondo and speak to Padre Pio about his son. At the monastery of Our Lady of Grace, he was able to see Padre Pio. But before he could explain the tragic situation, Padre Pio said to him sternly, “You jeopardize the life of your son and then you have the nerve to come to this monastery! How could you do that?” The man was shocked and angered. He left San Giovanni Rotondo and vowed to himself that he would never return. But later, having no other ideas regarding how to help his son, the man decided to visit Padre Pio again. The second visit to the monastery was no better than the first. There were no words of consolation from Padre Pio, no offer of assistance, no sign of hope. His son’s condition showed no improvement. The man returned a third time to see Padre Pio. On his third visit, Padre Pio spoke to him and told him that his son would indeed get his mental faculties back. The words proved to be prophetic for his son’s condition began to improve. He made a complete recovery and was able to live a normal life, free from any mental impairment. The man continued to visit San Giovanni Rotondo whenever he was able to. One day he was standing in the church near the area where Padre Pio was hearing the women’s confessions. Several times, Padre Pio looked up from the confessional and stared at him. Every time he did so, the man lowered his eyes. Finally, the man reasoned to himself, “Why am I lowering my eyes each time that Padre Pio looks at me? It makes no sense. If he looks my way again, I am going to look right back at him.” Padre Pio looked at him once again, and true to his word, the man stared right back at him. As he did so, it was as though two flames shot out of Padre Pio’s eyes, as if to consume him. He lowered his eyes immediately. Once, on the eve of the feast of St. John the Baptist, John McCaffery and several others were engaged in a conversation with Padre Pio. They were standing together in the hallway right outside Padre Pio’s cell. “Well, John,” Padre Pio said, “since you share the same name as St. John, tomorrow is your feast day too. I will be praying for you as well as for your wife and children tomorrow at the Mass.” Padre Pio bid goodbye to the other men he had been talking with and invited John to come inside his cell to visit. However, on that particular night, John noticed that Padre Pio looked very ill. He was deathly pale and seemed completely drained of strength. Just as John entered the cell, Padre Pio started to faint. Luckily, John caught him before he hit the ground and was able to help him to a chair. 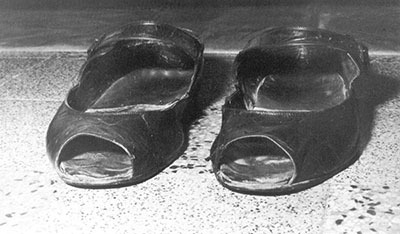 Padre Pio wore specially made shoes of soft leather with the top cut out because of the pain in his feet. As Padre Pio rested in the chair, John noticed that his ankles and feet were very swollen. One of the Capuchins once described Padre Pio’s feet as looking like “two watermelons,” because of the swelling. 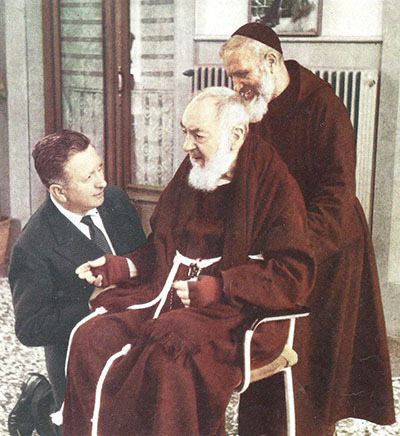 Padre Pio’s personal attendant said that he was in a panic whenever he had to help Padre Pio put on his shoes. The slightest touch to his instep always caused him great pain. The next day, John visited Padre Pio in his cell once again. He seemed to be feeling much better. “On this feast day of St. John the Baptist,” John said, “I wonder if I could ask you for a favor?” “What favor would you like to ask of me?” Padre Pio asked. “I would like you to sign a holy card for me,” John replied. Padre Pio was happy to do so. John noticed that it was very difficult for him to hold a pen. The wound in his hand made it hard for him to wrap his fingers around it. It was also difficult for him to write legibly. John noticed by the expression on Padre Pio’s face that it was painful for him to write. Although John treasured the holy card, after seeing what it cost Padre Pio to write the personal message, he regretted that he had asked him for the favor. John, on one occasion, felt an overwhelming desire to see Padre Pio. It was on the feast of Corpus Christi. John decided to take the train to San Giovanni Rotondo, even though he knew he would have to catch a train and return to Milan that very evening. He felt that if he could see Padre Pio that day, it would be well worth the long hours of travel time. The feast of Corpus Christi was indeed a magnificent celebration in San Giovanni Rotondo. A full band ensemble provided the music while young girls in beautiful white dresses led the large outdoor procession, strewing flowers along the processional path. The Blessed Sacrament followed behind under its traditional canopy. John had arrived in San Giovanni Rotondo in ample time and was in the church well before the festivities began. Unfortunately, he had not been able to see Padre Pio like he had hoped to. An announcement was made in the church that instructed everyone, both clergy and laity, to exit the church and assemble outside. The Corpus Christi procession was about to begin. Directly after the procession, John would have to catch the train to return home. John knew that Padre Pio would not be able to participate in the Corpus Christi celebration that day. It would be impossible for him to walk in the procession. John was certain that Padre Pio would remain inside the monastery. His desire to see Padre Pio was so great that, instead of following the line of people who were exiting the church, he stayed behind. Quietly, and with great care so as not to draw attention to himself, John walked up the stairs that led to the choir loft. He waited there until he was certain that everyone had gone outside. When John was convinced that he was completely alone in the church, he left the choir and made his way to the corridor near Padre Pio’s cell. By positioning himself in the corridor, John would be sure to see Padre Pio if he left his cell for any reason. As John waited, the thought occurred to him that Padre Pio might be angry with him. He had purposely disobeyed the instructions that had come over the church’s loudspeaker. Instead of exiting the church like all the other people, he had hidden in the choir loft. John knew that Padre Pio had a great respect for rules and made it a point to observe them to the letter. John had seen Padre Pio’s anger on previous occasions. It could be a shattering experience to be the object of his anger. The more John though about it, the more nervous he became. John decided that he better have an explanation ready, a line of defense, just in case he saw Padre Pio and found that he was upset with him. He would tell Padre Pio the truth. He would explain to Padre Pio that he came to the monastery that day because he had a great desire, a great need to see him. If it was simply a matter of attending the Gesu Sacramentato procession, he could have just as easily stayed in Milan. John turned the phrase over in his mind, “Gesu Sacramentato.” He was very pleased with himself for thinking of it. He had never heard it used before. Suddenly John heard footsteps and then he turned to see Padre Pio coming toward him. John greeted him and said, “I was hoping that I could see you today. I hope you are not upset with me for staying behind in the church.” “No, I am not upset with you,” Padre Pio said. “Let’s go to the sitting room and have a visit.” John breathed a great sigh of relief. John asked Padre Pio how he was feeling and he replied in his customary manner, “Let us thank God.” He did not like to speak about his health problems. By simply saying “Let us thank God,” to any inquiries about his health, he showed that he left all such concerns in God’s hands.